I was recently one of thousands of people to see your classified ad about rehoming your dog, and I thought others might benefit from this experience. First, you say you “tried your hand” at owning a GSD/Golden mix. Trying your hand is something you do with container gardening, not with an animal who can suffer if you fail. Not only that, it’s an inexcusably offhand way to describe your failure to recognize that you were making a serious commitment. You also say that your little trial has proven to you that the dog needs too much exercise to be a good dog for a two-room apartment. You know what else would have proven that to you? THIRTY MINUTES ON THE INTERNET. GSDs are working dogs, and Goldens are famously high-energy when they are younger, and a few quick searches would have told you that. You continue on by saying you have to be honest with your limits. Wow, a whole lot of soul-searching must have gone into that new self-awareness — or maybe it’s a quick way to deflect criticism you know you deserve. The bottom line is that your confession is supposed to be humble, but in reality it’s a way to let yourself off easy. I don’t really want to get started on with your upbeat “You never know until you try!” Maybe that’s acceptable for trying a new food, but you are dealing with a living creature who will suffer when he is passed on to someone else. Switching homes is disruptive for dogs, and I can pretty much guarantee you your dog will be depressed, stressed, and confused when he goes to a new home. At least, that’s what I’ve seen with the hundreds of owner giveups I’ve dealt with. You can’t be cavalier with an animal’s emotions like that. Now you’re going to pass the dog along to a good home for no cost. Again, a little Google time would have told you why this is a terrible, dangerous idea. 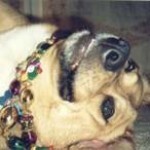 This Dogington Post article provides a nice summary. I literally know hundreds of dogs who ended up in the care of animal hoarders who got their dogs through “free to good home” classifieds. The hoarders knew exactly what to say, and the owners didn’t question it, even when it was clearly too good to be true. In addition to these more dramatic stories, there is also the bottom line that people who are looking for free dogs are often people who don’t have enough money to own a dog otherwise. Is that person going to be able to provide medical care for a dog or incur any of the other surprise costs about owning a dog? No. With such owners, when the time comes, dogs who get expensive end up at the pound. You also say that your 60-pound dog is a medium-sized dog. On what planet? A medium sized dog weighs between 30 to 40-ish pounds — there’s a little wiggle room. But at 60 pounds, your dog is large, and considering the breed combination, probably quite tall, too. 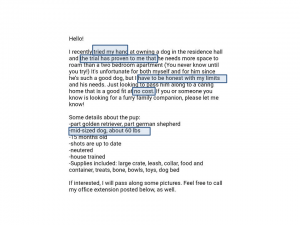 If you rehome this dog, you’re going to need to make sure that the owner is even allowed to own a dog this large according the rules of their apartment or HOA. Were you planning on asking for proof of that? If these people are previous pet owners, do they have a history of providing vet care for their dogs? You’d be surprised at the people who don’t. Had you factored in checking vet references? What happens if the dog fails in this new home? Were you going to take the dog back, or would the dog end up getting passed on to unsuitable owner after unsuitable owner until it either lucked out or ended up in a shelter? In a way, I feel bad about singling your ad out for criticism. You’re certainly not alone in your irresponsible, almost arrogant behavior. But at least I took out your details, and maybe your mistakes will help someone else to avoid them.